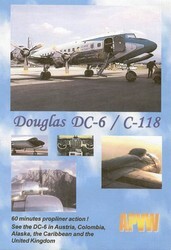 Douglas DC-6 C-118 is a DVD that offers footage of operational DC-6s in Europe, the Caribbean, South America, and the United States. The Douglas DC-6 was one of the first airplanes to fly a regularly scheduled around -the-world route. With its higher performance, increased accommodation, greater payload and pressurized cabin, it was a natural evolution of the DC-4. During its 11-year production run, Douglas delivered 704 DC-6s, 167 of them were military C-118 or R6D versions. In the volume, you will experience aircraft operating in Austria, Colombia, United States, Caribbean and the United Kingdom, plus flights on board two aircraft. Fly over the Austrian Alps and the Colombian rain forest, see cargo haulers in Alaska, the Caribbean and the United Kingdom. The DVD is in NTSC format and is region-free. Run time is about 60 minutes in color without any narration.